Trump Budget Proposes Deep Cuts To Program Detecting Disease Outbreaks Worldwide : Goats and Soda The budget would eliminate $120 million a year from an ambitious U.S. program that aims to set up an early-warning system for infectious diseases. 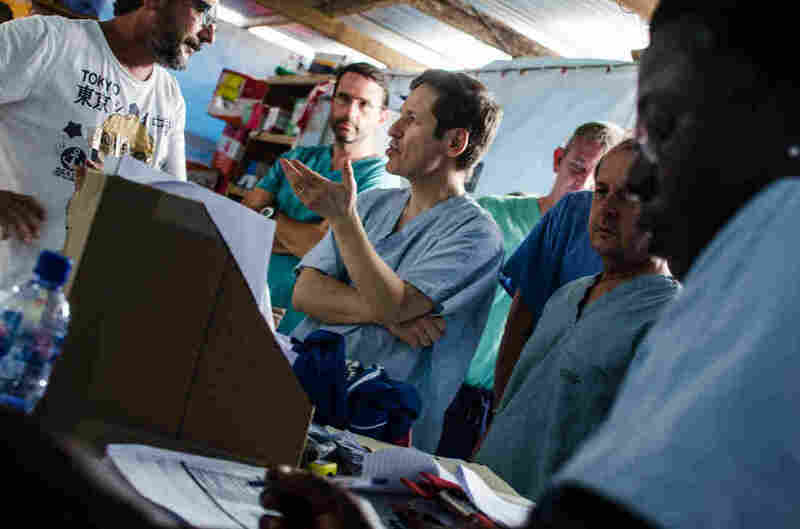 In August 2014, Dr. Thomas Frieden, director of the U.S. Centers for Disease Control and Prevention, talked with Doctors Without Borders staff during a visit to an Ebola treatment center in Monrovia, Liberia. Still, the proposal has critics worried. "Cutting this money is shortsighted," says Dr. Paul Spiegel, who directs the Center for Humanitarian Health at Johns Hopkins University. "By downsizing this program, outbreaks may not be detected as quickly now, and in the end, the U.S. could wind up spending more money [to stop an emergency outbreak]." In Trump's proposal, funding for the program would drop by about two-thirds, from about $180 million each year to about $60 million each year. As a result, the Centers for Disease Control and Prevention is planning to downsize its operations — or even close up shop — in 39 countries by September 2019. It will continue its work in 10 countries. At first, the CDC had only about $60 million in its budget for the program. Then in the summer of 2014, Ebola struck West Africa. The U.S. ended up spending billions of dollars to stop the outbreak both overseas and here at home. And all of a sudden, there was much more interest for the CDC's new disease-detection program. Congress allocated an extra $600 million to be used over five years. Without that kind of funding, critics say progress made since 2014 will falter. "It takes years to set up a disease surveillance system in a country," Spiegel says. "It's a waste of money to stop now and leave a country after you've already invested a few years into the process." "We don't need to panic over these funding cuts," Jha says. "It's not like 'Oh my gosh! We need to fix this right away. "But the cuts are a big deal," he says, "because infectious disease outbreaks are increasing not decreasing, and we are becoming more interconnected, not less interconnected." And so, Jha says, the federal government is going in the wrong direction. "We should be increasing our investment in GHSA, not decreasing it," he says. "The program is really a great bang for the buck."